Sewing machines are tools that can create a multitude of beautiful, fun, and useful items but when they are not in use, their appearance can be a bit of an eyesore. Why not use your sewing machine to adorn itself by sewing a custom-fit sewing machine cover? This cover will not will not only be pleasing to look at when you have finished sewing for the day, but it will also provide you with storage pockets for the little things you need and safeguard your machine from dust and dirt. This is a simple design that's perfect for a sewing beginner. 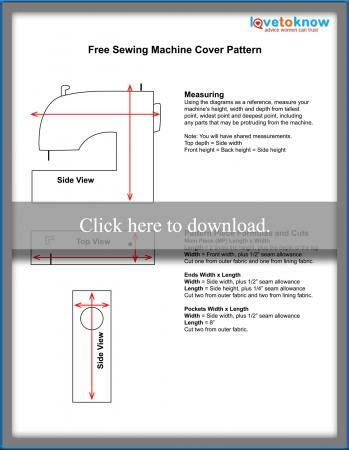 For instructions on measuring your machine and making your pattern pieces, click on the image below for diagrams and formulas for creating your custom-sized sewing machine cover. If needed, the Guide for Adobe Printables will help you in downloading and printing the PDF. Measure your machine and cut your fabric pieces. Cut two strips of single-fold bias tape the same length as the width of a pocket. Unfold one edge and press with an iron. Lay one pocket on your work surface with the wrong side facing up. Choose which edge will be the top. 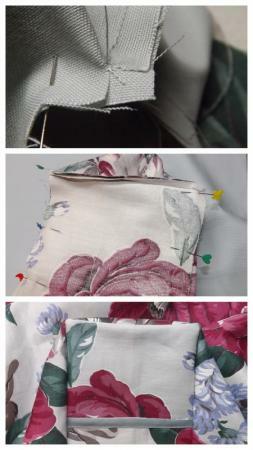 Place the unfolded edge of the bias tape on the pocket top with the back of the tape facing up. Note: The crease line from the unfolded edge will still be visible. Sew on the crease line to attach the tape to the pocket. Fold the tape to the front of the pocket and press. Top stitch the edge of the tape to finish the edge. Repeat this step on the remaining pocket. Lay one outer fabric end on your work surface with the right side facing up. Choose which edge will be the bottom. Place a pocket on the end piece with the right side facing up. Align and pin the bottom and side edges. Baste the pinned edges to hold. Repeat this step with the remaining end and pocket. Lay the outer fabric main piece (MP) on your work surface with the wrong side facing up. Measure to find the center of each length edge. At the centers, measure in 1/4" and mark with an ink pen. Lay the outer fabric ends/pockets on your work surface with the wrong sides facing up. Measure to find the center of each top edge. At the centers, measure down 1/4" and mark with a pin. Measure in and down 1/4" from each top corner and mark with an ink pen. Turn the MP over with the right side facing up. Place one wrong-side-up end/pocket on the MP. Match the marked center of the end pocket to the center mark on one length edge of the MP and pin. Continue to pin the remainder of the end/pocket's top edge to the MP. Sew the pinned edge from one marked corner point to the other marked corner point using a 1/4" seam allowance. At the ends of the stitch line, make a small cut to the stitch line from each MP edge. Do not cut the end/pocket piece. Continue to sew the edge of the MP down each length of the end/pocket sides. Repeat Steps 7 and 10 to attach the remaining end/pocket to the other length edge. Repeat Steps 5 through 10 to assemble the lining. Note: There are no pockets on the lining. Turn the lining right side out. Insert the wrong-side-out outer piece inside the lining. Match up the corner seams and pin. Measure around the bottom edge of the cover and add 1". Cut a strip of the bias tape using this measurement. Unfold one edge and press with an iron. 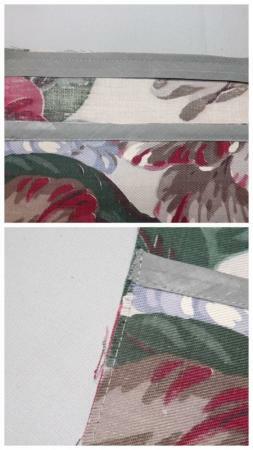 Place the unfolded edge of the bias tape on the lining side with the back of the tape facing up. Stitch the tape through all layers along the tape's crease line. Overlap the ends. Turn the cover right side out. Fold the tape to the front and press. Top stitch the edge of the tape to finish the edge. Don't let tiny roadblocks prevent you from attempting your own custom sewing machine cover. Try the following tips and adjustments to aid you in completing your one-of-a-kind cover. For a smoother fit, remove the power cord and lower the spool pin before measuring your machine. 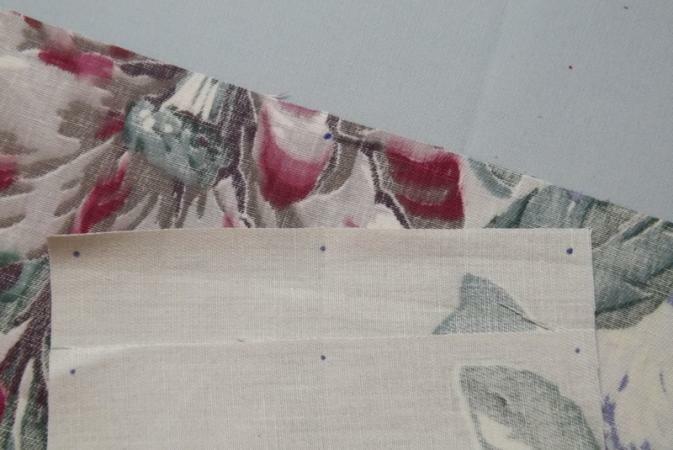 Lighter fabrics can be used for the outer fabric. Apply fusible interfacing to the backs of each outer fabric piece to hold the cover's shape. For a reversible cover, add pockets to the lining ends. Additional pockets can be added to the front and back of the cover. Cut each pocket 8" tall by the same width as the main piece. Add a pocket to each end of the MP. Top stitch a seam down the center of each long pocket. This will turn the long pocket into two and prevent gaping. You may see the benefit of covering other machines in your craft room after finishing your sewing machine cover. The visual clutter of sergers, die cutters, or other bulky tools will instantly look tidier with custom-fit covers. Using the same measuring instructions as for the sewing machine, make covers for any machine you need.